I had the rare privilege of doing a global study sabbatical between leaving my 11 year presidency at Siena College and assuming a new presidency at Mount Saint Mary College in Newburgh, NY. This study sabbatical introduced me to so many people from so many different cultures: China, India, Israel, southern and northern Africa, the Balkans, and Italy. In particular, this sabbatical brought me to the old city of Jerusalem where I was intent on re-experiencing the central mystery of our Christian faith: the passion, death, and resurrection of Jesus. When I told a friend that I was going, among other places, to Jerusalem, he expressed surprise and concern. “Do you really want to go there now,” he said. It’s not safe, he advised. There’s too much random violence and economic hardship. Moreover, the rows of shops in the old city that sell every conceivable religious item—from icons and crucifixes to plaques and other religious trinkets—can be off-putting. Despite President Bush’s call for an end to the Israeli occupation and settlements on Palestinian territory, a viable Palestinian state appeared to be less and less attainable. Ordinary Israelis and Palestinians seem more divided and polarized than ever before. Israeli checkpoints, especially the so-called “Israeli security wall,” continue to aggravate Palestinians on their way to school, work, or hospitals. When I went to Ramallah in the West Bank, young armed Israeli soldiers stopped me and my Palestinian driver to check my passport and car. I sensed the wall is making Palestinians more resentful of Israelis and breeding more hate. Both Israelis and Palestinians seem to live in greater fear. An Israeli told me that for the first time more Israelis are emigrating out of Israel than immigrating into Israel. Christians definitely are disappearing. The Israeli government policy of completely separating the two populations plays right into the hands of the radicals on both sides. As one person phrased it, if you have no contact with people, it’s easy to believe that every Palestinian is a terrorist and every Israeli person is an oppressor. He wondered whether Israel was becoming an apartheid state. While there is so much to see in and around Jerusalem, e.g., the Israel Museum with its Dead Sea Scrolls and its 2nd temple model, the Temple Mount and the Western or Wailing Wall, the Tower of David and the ramparts walk, the Dormition or “sleeping” of Mary Abbey, the Yad Vashem Memorial to the Holocaust, the Chagall windows at the Hadassah Hospital, the Mount of Olives and the Garden of Gethsemene, I chose to concentrate on three holy sites: The Cenacle or Upper Room, the Via Dolorosa or Way of the Cross, and the Church of the Holy Sepulchre. The Old City is divided into four quarters: the Christian, Armenian, Muslim and Jewish quarters. (use photo). The walls of Jerusalem have expanded and contracted at least twelve times. And although scholars debate whether Jesus actually celebrated his last supper in this Upper Room or walked along today’s Via Dolorosa, the Holy Sepulchre is probably the place where Jesus died, was buried and rose. 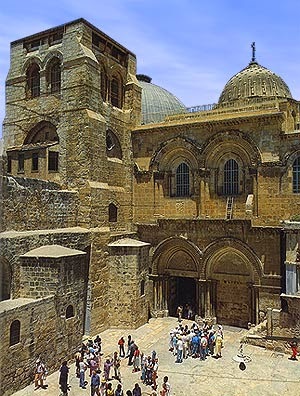 Jerome Murphy-O’Connor’s The Holy Land: An Oxford Archaeological Guide is an excellent visitor’s guide to Jerusalem’s archaeological heritage. And Stephen Doyle’s The Pilgrim’s New Guide to the Holy Land, a popular spiritual guide, was immensely helpful in transforming me from a tourist into a pilgrim. This pilgrimage into the sacred sites of the Old City reawakened my faith in Jesus Christ as our Lord and Savior. I began my pilgrimage by walking in the afternoon from Holy Savior friary where I stayed to the Cenacle or Upper Room to re-experience the Lord’s Supper. The Cenacle is outside the walls, beyond Zion Gate, a place where you can’t celebrate the Lord’s Supper but simply meditate on this mystery. And that I did. When Jesus sat down to his last supper, he faced three challenges. Jesus had to leave us and yet wanted to stay with us. He solved this first challenge with the words:” This is my body; this is my blood.” Yes, the bread and wine look and feel and taste like bread and wine but they mystically become the reality of the Risen Christ, his presence among us. Jesus also wanted to die for each one of us and yet he could die only once as a human being. He solved this second challenge with the words: “Do this in remembrance of me.” The same victim who died in Jerusalem centuries ago returns to altars wherever the Eucharist is celebrated. And finally Jesus wanted to be one with us, impossible this side of heaven. He solved this third challenge with the words: Take and eat; take and drink. Jesus becomes one with us in communion. And what is the purpose of the bread we eat? And the blood we drink? To form us into a faith community. St. Paul wrote: because the bread is one, we, though many, are one body. This bread we eat and this blood we drink should not only form us into a deeper faith community but also empower us to reach out compassionately (especially with our time, talent, and treasure) to the people we meet every day. A powerful meditation for me. The next morning about 10 a.m., I began my pilgrimage walk along the Via Dolorosa, or Way of the Cross, and eventually made my way into the Church of the Holy Sepulchre, probably the site where Jesus was crucified, buried, and raised from the dead. As I stopped at each station on the Via Dolorosa, I prayed with The Pilgrim’s New Guide to the Holy Land. Our Christian faith proclaims that hidden in every Good Friday is an Easter hope. And as I reflected on the sufferings of Jesus along the Via Dolorosa, I couldn’t help but think of a story by Elie Wiesel, the Nobel Prize winner and survivor of Hitler’s concentration camps. In his work, Night, a memoir of his experiences at Auschwitz and Buchenwald, Wiesel describes how the SS marched all the inmates to the roll call grounds and there hung a youngster – all because an inmate had escaped and as a warning to the inmates not to try another escape. And as the youngster hung there dying, Elie Wiesel, a youngster himself, heard a voice behind him say: where is God now? Wiesel questioned, not the existence of God; no, rather he questioned the justice of God. He agonized over God’s silence in the face of overwhelming evil in these concentration camps. That very question-where is God now?-has been echoed thousands upon thousands of times in human life. It’s an eternal question: highlighted in the Book of Job in the Hebrew Bible, highlighted in The Confessions of St. Augustine, in 19th century literature of Fyodor Dostoevsky, and in best sellers like Rabbi Harold Kushner’s When Bad Things Happen to Good People. We should avoid negative judgments about ourselves if we are indeed suffering or ill. To say, “I really deserve it,” is really a form of self-hatred. And finally, we ought to remember that the mystery of suffering and illness has healing and redemptive powers for ourselves and for others. Why? Because Jesus, through the mystery of his own passion, death and resurrection, healed us, made us one with God. Our faith proclaims that hidden within the mystery of suffering is the glory of the resurrection. Jesus proclaims loudly that suffering and death are not the final reality; healing and resurrection are. And in the meantime Jesus challenges us to fight against evil and suffering, to heal, console, forgive and create compassionate communities where all people can experience human dignity, freedom of religion, fairness, peace, truth and opportunity.